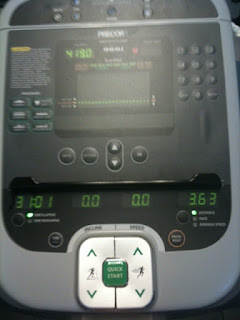 The last thing I wanted to do yesterday was work out. I was too busy enjoying my day off from work thanks to Memorial Day. Once I dropped off my weekend visitor at the airport I figured I had enough time for a quick run at the YMCA. I managed to do the following while watching "5 Ingredient Fix" on the Food Network. I surprised myself last night by actually making a "real" dinner instead of just a bowl of cereal or frozen chicken nuggets. Ryan traveled to Houston yesterday so it was dinner for 1 again. 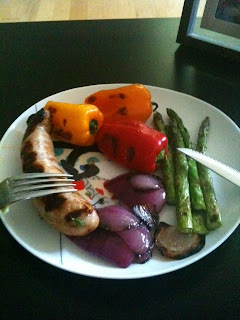 I brought out my trusty grill pan and made a spicy chicken sausage, some asparagus, sweet peppers, and a couple pieces of red onion. All of it was grilled together on the pan and turned out delicious. It was like I was having my own private indoor BBQ.